Does your company encourage you to ride your bike to work? Do they provide covered, secure bike parking or a changing room and/or shower? While many companies provide subsidies to employees who drive, mostly in the form of a free parking space, they could also do the same for bicyclists. In this eco-aware age, employers are increasingly rewarding staffers who leave their cars at home and pedal to work. It usually takes a nudge from an employee or two, “a squeaky wheel to get the process going,” says Elizabeth Preston, spokeswoman for the League of American Bicyclists. Here, during national Bike to Work month, a look at a half-dozen bike-friendly companies. If your company has similar incentives, let us know. We'll compile a list and will suggest that this efforts be rewarded, possibly at next year's Bike to Work Day event. 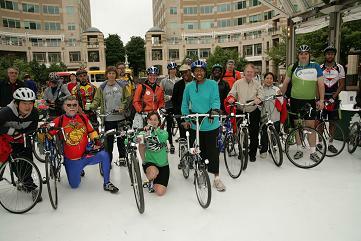 Thousands of people turned out to celebrate Bike to Work Day in the DC area last Friday, May 18. FABB members were at all of the Fairfax pit stops talking to cyclists about how they can help make Fairfax more bicycle friendly. Lot's of people signed up for the FABB newsletter. In Reston 320 people showed up, a record number. Fairfax Connector staff were present with a bus equipped with the new bike rack on the front. Cyclists were shown how to mount their bikes on the new racks. Check out the photos from the Reston pit stop. That's Supervisor Hudgins in the teal sweatshirt with her folding bike. She rode to the event. Tomorrow is the Bike to Work Day. I hope everyone is planning on riding to work that day, including a stop at one of the many pit stops around the region. FABB members will be at each of the Fairfax County stops as well as the Alexandria stop. Probably the most heavily used trail in the region, and perhaps all of Virginia, is the W&OD Trail. It's often referred to as just "the trail". However, it should be called "the trails", because it consists of two trails, the paved, multi-use trail and the unpaved "horse" trail. The W&OD can be very crowded on the weekends and evenings. During the week there are sections that also get crowded, mostly with people taking a walk at lunchtime. Being a multi-use trail, there are slow, casual cyclists sharing the space with fast, competitive cyclists who are often in pacelines. There are kids walking or on bikes, roller bladers, and walkers and runners. The Post even did a rather exaggerated story a while back on the trail congestion. We think there are a couple of ways to relieve some of the congestion on the trail. The parallel gravel trail gets very little use. In theory one would think it would be a much better surface for runners and walkers, causing less strain on the joints and tendons. I think there are a couple of reasons the gravel trail gets less use than the paved trail. Most walkers and runners probably want to be part of the passing parade of humanity, to see and be seen. Another reason may be that there are a few stream crossings without bridges and people get tired of having to backtrack to the paved trail and they simply stay there. NVRPA could conduct a campaign to encourage more people to use the unpaved trail. Many accidents on the trail involve only trail users, often cyclists attempting to pass pedestrians, resulting in a collision. To address the concern about the stream crossings, NVRPA could either sign the presence of the stream crossings, or install bridges or fair weather crossings for those on foot. Another way to reduce congestion is to provide alternatives for cyclsts who want to ride on the road. We need better on-road cycling conditions. Some roads can be restripped so that travel lanes are narrowed to create bike lanes. Other roads need paved shoulders. By allowing fast road cyclists to actually become "roadies", they would be happier as would those human slalom poles on the trail. FABB is currently working with Fairfax County and VDOT to ensure that repaving projects and new roads include some pavement for cyclists. For the first time, VDOT will start paving some of the unpaved shoulders on many roads. They are also working with Charlie Stunk, the Fairfax County bike coordinator, to start repaving roads like Gallows Rd to create bike lanes. The roads belong to us all, and it's about time that cyclists were accommodated. 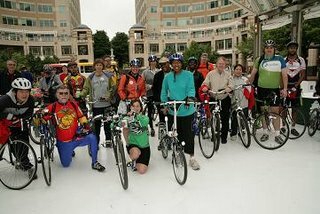 The Reston Connection recently published an article on bike commuting in which FABB is mentioned prominently. The title is “This Commute Avoids Traffic” which isn't quite the case. We can usually avoid much of the congestion around here by taking alternate routes or bypassing backed up traffic, or if you're really lucky like me, use the W&OD Trail for much of your commute. We're hoping that lots of people try bike commuting for a day, during Bike to Work Day, and discover the joys of getting exercise and having fun on the way to work (and on the way home). VDOT is proposing to widen Stringfellow Road between Route 50 on the north and Fair Lakes Blvd just north of I-66 to the south. This is an important future bicycle route connecting Fairfax County Parkway to the north and the Fair Lakes and the many public facilities along Stringfellow Road. FABB, WABA and others concerned about an on-road bike route on the road recently met with VDOT and Fairfax County staff to discuss the project. The current plan includes a wide curb lane as the on-road facility. While we would prefer narrower travel lanes and a 5-foot stripped bike lane, we will support the wide curb lane at the June 12, 2007 public hearing (see the events page for more details). Cyclists should attend the June public hearing to speak out for this facility (See the VDOT Stringfellow Road Project page for background info). The current plan contains 4 travel lanes with the inside lane being 11 feet and the wide curb lane 14 feet. There will be a 10-foot multi-use trail and a 5-foot sidewalk. We feel strongly that the on-road facility is needed for bicyclists. Studies have shown that cyclists are safer on-road. For a discussion of this topic see the Wikipedia entry for Segregated cycle facilities. On-road cycling allows the use of existing roads that are connected and provide more direct routes to major destinations, especially given the incomplete and poorly maintained trail network in Fairfax County. FABB is participating in the meetings of the Reston Metro Access Group. The citizen group is working with county staff and a transportation contractor, Vanesse Hangen Brustlin, to plan pedestrian, bicycle, transit, and motor vehicle access to the future Wiehle Ave and Reston Parkway Metro stations. A public meeting was held on March 27, 2007 and 54 community members discussed issues related to accessing the stations. When asked what was their preferred mode of transportation for accessing the stations, 52.4% said they planned to walk, and 19% said they would bike. When people have a choice, with safe, convenient access, they will walk and bike. This is contrasted to the VHB report on existing transportation conditions around the stations. Based on Census data on commuting patterns, 1% walk. Bicycling isn't even broken out as a separate category, it's lumped in with walking. It also only accounts for commuting trips, not the many other trips that we make in the region, including bicycle trips on the weekends. Often in discussions of transportation facilities, bicycling and walking are dismissed as fringe activities, and the 1-2% bike/walk commute numbers are used to support the argument. The better figure is the number of people who, given the choice, would walk or bike, not only to work, but for all the other short trips we take in this region. More bikes are sold in the U.S. each year than cars. About 30% of everyone rides a bike during the year. Most people own bikes; they just need better facilities on which to ride. There will be another public meeting of the Reston Metro Access Group, likely in June. Bicyclists are encouraged to attend. Check the FABB events page or the RMAG page for info about the meeting.